Author Mike Wolff joins Inklings Press for a chat about his work – dabbling in fantasy, science fiction, horror and a true appreciation of metal. 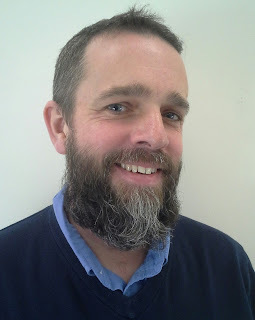 Hi Mike, good to chat with you. We first caught up with you over Twitter – so to start with, perhaps it's best to ask you to tell readers briefly what they can expect from your writing. First off, thanks for inviting me to talk on your Q&A. What can people expect from my writing? Good question. I usually say I take my writing seriously, but I’m not serious about what I write. I like to weave a bit of humor (mostly dark and twisted) into my stories. Basically I like to have fun and use a lot of puns; the worse the pun, the better. I also like to emphasize that I try to write for a teenage audience. I’m not trying to change the world with my stories, only entertain you a bit. Reading your stories and your website, it seems you have a great deal of fun with your writing. It seems to be very much something you enjoy, is that right or do you have those moments of raging at a blank page wondering where the words have gone, too? I’d be lying if I said I never ‘raged’ at a blank page, but yes, I write to have fun. When I get to that raging point, I just stop writing. It’s not my full-time job, nor my part-time job, so I can stop if I need to. I first started writing about 12 years ago during my lunch hour to kill the boredom, and I haven’t looked back sense. I write what I like and hope others find it fun and interesting. You recently ran a free promotion for your books on Amazon – as did we with our Tales From The Tavern anthology - how did that go? We found ourselves doing a whole lot more promotion for the free offer than we shyly tend to do when we're asking for money! What would you say you've learned from doing it or that others could learn from? The answer to this is a bit complex, but I’ll give it a go. This was not the first ‘free’ promotion I’ve done since I started self-publishing my books. Over the past 2-3 years I’ve probably given away 200-300 copies of my work, about 60-ish during this round of promotions. I have done it to hopefully garner more reviews, but that has not panned out too well. To date, I have only a small handful of reviews for each of my books; so it didn’t lived up to my expectations. And for some reason, I also promote more when it’s free than any other time. What I’d say to anyone that is going to try the free route, would be; do it, limit the time on the offer and keep expectations low. Maybe not the best advice, but it’s what I’ve got. The size and involvement of your social network has a lot to do with your success. OK, you have two minutes in an elevator to press one of your books into someone's hands and explain to them why they would be interested in it... go! This is the hardest question you can ask. Ugh! Do you think the idea of Bigfoot being real is cool? 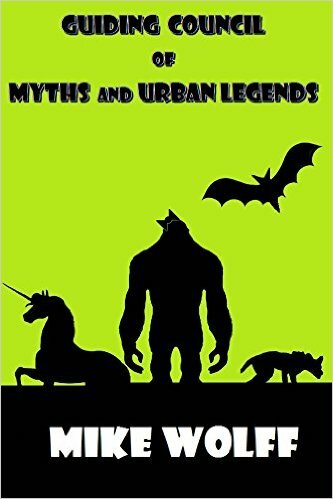 How about all the other myths and urban legends? You know that would be cool, right? Well what if it all was real? My books Guiding Council of Myths and Urban Legends and the sequel Seeking Control of the Myths that Never Should Have Been talks about that very topic. I know, you’re not a believer by the look on your face, but seriously…think back to a simpler time when you were a kid and everything was possible. Well these books fit the bill. Oh, and did I mention they are laced with dark humor and some enormously bad puns? You know you want to read something like that, right? That's sneakily two books but we'll let you off! Reading through your Twisted Tales, you seem very drawn to horror, with a chaser of dry humor – is that where you feel most at home or does that just most suit that collection? I think that when I write short stories, they tend towards horror. My full-length stories tend towards fantasy. So I’d have to say horror is more suited for that collection and my second volume of short stories…Twisted Tales Volume 2. Stories such as The Caretaker and Phosphenes in your Twisted Tales collection very much have a feel of the world of Stephen King or James Herbert, though with the latter story perhaps confronting issues such as religion and faith more head-on than those kinds of writers. Who would you say are your biggest influences? The biggest influence on what I write is probably not an author, but the music I listen to and my personal beliefs. Some may say it’s a contradiction, but I am a full-fledged Metal head and a Christian. So I listen to some seriously dark music, but have a very strong faith. Yeah, it’s messed up, but that’s me. I like the darker things, but see the need for compassion in the world, so that ends up in a lot of my stories. I’ve had my other stories compared to Aesop’s Fables as well as traditional fairytales…yeah, shocked the heck out of me, and by more than one person too! So maybe I was influenced by stories I heard when I was a kid??? I don’t know, I’m grasping here. What are you working on at present and what do you hope to publish next? 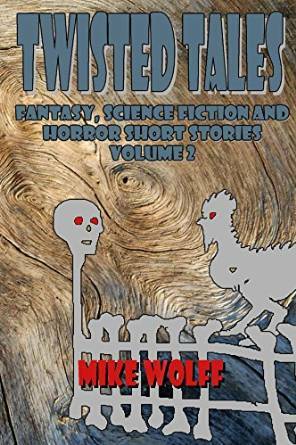 I just finished releasing my second collection of short stories: Twisted Tales – Fantasy, Science Fiction and Horror Short Stories Volume 2. It’s got a terribly ugly cover and some twisted stories inside. I’m also working on a full-length fantasy novel currently titled The Brotherhood of the Locust: Rise to Power. I’m only about 15k words into that one, but I like what I have so far. It started out as a weird dream and I’ve went with it. Most of the stories I write start that way. I hope to have that out by Fall 2016. I’ve been really busy at work, so I haven’t been able to write on my lunch hour much lately. What do you find to be the hardest part of the process as an author – and by that, we mean the whole business from putting pen to paper to trying to convince people to buy your books? Promotion. Hands down, this is the hardest part of being an author. I keep my books cheap to hopefully draw in new readers and I promote as much as I think safe without being too annoying, but it never seems to be enough. Writing is easy…yes, it is. If you’ve never tried, you should. Everyone has a story to tell. And once you get a single book self-published, that process is easy too. I can’t say how difficult it is for traditional publishing, as I’ve never tried it. And what would you say has been the most helpful piece of advice you've received with regard to your writing and publishing? Just keep writing. Write for yourself first. That is what I do, and that is what I preach. If you go into writing to make millions, then you may be disappointed. Sure, it happens, but the odds are against it. But, if you write to make yourself happy, you may just succeed. And surprisingly, you may just find a few like-minded people that enjoy what you write, which is truly a great reward for your efforts. As well as your love of metal, your blog shares your love of woodworking. This tells us two things. 1) We should be polite to someone who knows how to use power tools. 2) There's always more to the authors we read than their writing. Tell us something that your readers might not know about you and that might be unexpected. OK, traditionally our final question is a two-part question. The first question is what are you reading at the moment, and the second is what is the book you've most enjoyed reading this year... as we're only a few days into this year, let's make that over the past year. Seriously folks, this is not planned, but I’m currently reading Tales From the Tavern and enjoying it a lot. As for a particular book from last year, I’d have to take liberties and say an entire series. The Book of Lost Doors series by independent author Misha Burnett is amazing. He released the fourth and final book of the series, Gingerbread Wolves in 2015, which prompted me to read the whole series and I loved it. Ha! Well, flattery will get you everywhere! Glad you're enjoying Tavern! Not encountered Misha Burnett's work before so that's a new name to go seek out. Many thanks, Mike, good to talk to you. Are you an author interested in featuring in a Q&A with Inklings Press? Drop a comment below or tweet us @InklingsPress. Wonderful interview. I'm currently reading the first volume of Twisted Tales and loving it! Great to learn more about you.